On March 27th, Huawei will officially introduce the P20, P20 Lite and the P20 Pro. The latter is Huawei's new muscle phone with top-of-the-line specs including three rear-facing cameras that feature Leica optics. This reportedly is made up of a 40MP sensor, a 20MP (monochrome) sensor and an 8MP (telephoto) sensor. 5X magnification is available when using the zoom capabilities of the 40MP and 8MP sensors. Huawei calls this feature "Hybrid Zoom." The aperture on the cameras range from f/1.6 to f/2.4. Adorning the front is a selfie snapper weighing in at 24MP. The Huawei P20 Pro is equipped with a 6.1-inch AMOLED display carrying a 1080 x 2240 resolution. That works out to a 19:9 aspect ratio. The display does have the "notch" and there is a fingerprint scanner on the bottom bezel. The home-grown Kirin 970 chipset is under the hood, and includes Neural Processing Units for AI capabilities. 6GB of RAM is inside along with 128GB of native storage, and some markets will offer a variant with 256GB of storage. Keeping the lights on is a 4000mAh battery (which replenishes fast using Huawei's SuperCharge), and the handset comes with an IP67 certification rating. The P20 Pro is 7.65mm thin and weighs 174g. It has Bluetooth 4.2, supports NFC and works on 28 LTE bands. The expected price in Europe is €899 ($1,110 USD). 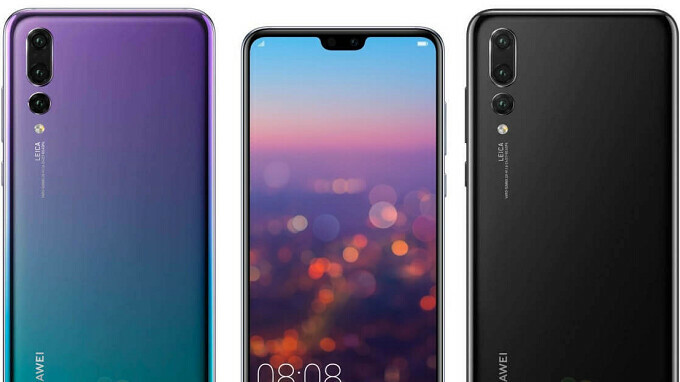 At the top of this story you can see the backs of both the blue and black Huawei P20 Pro flanking the front of the model (obviously the image is not done to scale). Click on the slideshow below for more images of the phone. I wonder how they fit a 40mp sensor into a form factor so thin. This is very intriguing though and if it turns out to be true that notch don't look so bad after all.lol Huawei might be pushing the industry forward with this one. We'll know soon enough. It depends on size, not resolution. I know that's why I said it's intriguing since the Nokia 808 and Lumia 1020 were thick phones with huge sensor sizes. This is gonna be crazy if they pulled it off. This is their new cpu. It’s only like 3 months old.lol. How can they come up with a new cpu that fast? 5 months since Mate 11... They should bring new cpu with P, then repeat on Mate. Not otherwise... LG and Htc got bashed by using 821 last year. No difference. P20 will be similar to SD835 phones, while other move to SD845. Nope. It's the other way around. The 960 was basically 835 features six months earlier than everyone else. Likewise for the 970 with its NPU. P10 is weaker than phones with 820/821. Mate 10 is almost on pair with 835. P series is more about design, form factor and camera. Mate series is about big size, battery and chipset. Id say that the Mate series along with new chipset should be released more earlier at same launch time as Pixel and Samsung Note series, although it does mean it would not be launched with latest android. Well done, Huawei. You managed to copy 90% of The iPhone X, a design praised by everyone. Job well done! Chin and notch, what a great combination... They look fantastic! And yes, we need 40MP cameras on our smartphones, the lens quality, sensor size, variable aperture, quad LED and all that photography nonsense can just go to... Well, wherever they like to go! Same goes go hardware performance. Who needs performance comparable to The Samsung Exynos, eh? People want to stare at that lovely, futuristic and downright classy notch and that's what they get with Huawei P20! Job well done, chaps! Huawei a spying and copying Chinese junk company. Phones are developed a couple years before release. I don’t think back then they knew what the Apple X would be. I think that’s an older reference for smartphone development. It is true that phones used to take 2 years for total development time but I believe now they have it down to just over a year or even less. Normally they start with just the technology they want to put into the phone and then they create the design around the technology. If you remember, Apple really wanted to have in-screen fingerprint scanning but because it wasn’t possible they had to design the notch after the fact. That is the ugliest notch and bottom bezel combination design. They should have hire a new design team. Pretty sure the iPhone X notch is bigger and uglier. Who the f**k decides to implement a notch and then keep the fingerprint scanner on the front !?!? Ohhhhh Huawei... ok !! Because the rear fp is crap location and under screen fp not reliable yet. Good luck WoWay with last year CPU, ugly notch, and >$1000. You're on my off list. Would've been better if the Fingerprint sensor was at the back. Majority still prefer fingerprint sensor on the front. Apple sued Samsung before for copying their device. They said the Samsung Galaxy S (or S2) looked like their iPhone 3G (or 3GS) or something like that (I can't really recall exactly). But they look completely nothing alike. Is Apple going sue Huawei for this? This I think is blatant copying. They can't because iphone X is not designed by Apple actually. Now, some companies prepare various designs for mobile phones and show there design to mobile phones companies and then they choose designs for there phones. If Apple have patent of there iPhone X's design then they sue every company who has notch or vertical dual camera. But at galaxy s time they actually designed it on own and have patents of that design also.